Yes, dermarolling and single-needling certainly is compatible with Botox. Just don't single needle or roll with a dermaroller with longer needles than 0.2 mm directly over the Botox areas for six weeks after Botox has been administered. Dermarolling / Microneedling / Concerns and questions regarding dermarolling.. I forgot to answer your question on whether dermarolling can speed up the fading of red (active) stretch marks. Dermarolling can speed up the fading of skin pigmentations. In most cases, skin pigmentation is caused by melanin (skin pigment). This is not the case with red stretch marks. The redness is caused by inflammation and dilated blood vessels. When the stretch mark matures it becomes white and has a very poor blood supply. The reason for using a dermaroller on fresh stretch marks is not really to speed up the fading, but it is an attempt to affect the process of maturation of still active/red stretch marks - to shrink their width and length. You should apply Tretinoin right after you finish rolling. Yes, start dermarolling and Tretinoin now. Unfortunately, we have problems importing Tretinoin so we have to drop-ship it to our customers directly from India but we are working on a solution that will hopefully work by the end of this year, so we can ship it from within the EU. For the time being, if you have a way to get it from your doctor, it will be better for you. Tretinoin passes without any problems to the United States but some countries in Europe do not allow it and it may be confiscated by customs. >NL lines) with time, patience, and vitamins? But if they are not deep, a 0.5 mm should also make a difference. >(2) Will using something like Frownies at night help at all or am I totally dreaming? Frownies are said to temporarily improve "expression lines" by applying a tight adhesive patch onto the wrinkle to prevent the muscle from moving - for example to prevent the muscle between the eyebrows to get into the frowning position. It is advised to keep the tape overnight. Frownies have lots of factual nonsense on their website. We looked at their before-and-after photo's and they are too tiny to be able to judge whether the "improvement" is due to a paintbrush in Photoshop or a real improvement. It looks Photoshopped and if the improvement was real, they would have published much, much larger pictures. In any case, any wide Micropore Surgical Tape or other tight plaster will do the same job. It is true that when we sleep in a certain position, we wake up with a "crumpled" face and taping your face overnight can possibly partially prevent it but if you have a boyfriend he may leave you for a girl who does not terrify him by sleeping with tape over her face. They give these instructions to apply the pad: "Moisten the back of the pad with Frownies Hydrator Spray and apply directly over the wrinkle." If you apply an adhesive pad on your skin for many hours or overnight, it will make the wrinkles temporarily less visible in the morning because the skin will slightly swell up due to increased moisture that forms under the pad. You'll notice the same effect when you stay in water for a long time. When you get out and look in the mirror, the face looks smoother because it is basically slightly plumped up by water. This effect unfortunately lasts very shortly. This is really difficult to say. I have not heard many successful stories regarding facial exercise but I do not want to discourage anybody from trying. BTW during a face lift, the skin and the layer between the skin and the muscles is repositioned (pulled up) but not the muscles themselves (except the muscle on the neck). If you feel that the muscles between your eyes are in permanent spasm – for example from long-term or frequent headaches or long-term stress etc. and that the muscles are now permanently in a frowning position, Botox will relax the muscle. Dermarolling twice a week with a 0.5 mm dermaroller or every second or third day with a 0.2 mm dermaroller will also relax the muscles to certain extent as it is a form of massage. You can also try the above mentioned tape method. First stretch the muscle with your fingers into the non-frowning position, and then tape it. Botox will relax the muscle but it will not fill in the existing wrinkle in the skin. This has to be addressed by needling or rolling. "I met with the environ lady a while ago and she explained the reasons behind using it. The needle size on the home versions are 0.2 which teeny and you won't even feel a thing whilst using it. It does work. The Tiny minute punctures made cause rapid new dermal Matrix to be made and also allows your creams , serums to be properly absorbed much deeper. I've been using one for years now." There is not much to say about it except that I do not agree with the statement "you will not even feel a thing when rolling with a 0.2 mm roller". You will definitely feel using a 0.2 mm dermaroller, it can be perceived slightly painful (at least in the beginning before the skin gets used to it) and later you may perceive it as "massage". I would not call it painful but you will definitely feel it. A 0.2 mm dermroller speeds up the turnover of the skin and it can improve skin conditions that are in the upper skin layer - epidermis - such as certain kinds of pigmentations, overall skin texture etc. It does not reach the deeper layer - the dermis and longer needles are needed to trigger collagen in the dermis. 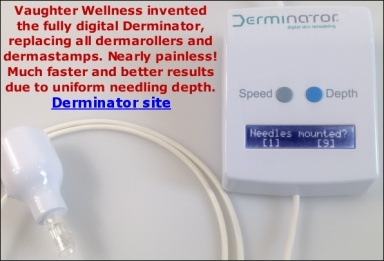 If it was true that a 0.2 mm dermaroller triggers dermal collagen, you would never need longer needles, regardless how deep in the skin the problem is. I have never heard about a clinic offering a professional dermarolling session for acne scars or stretch marks with a 0.2 mm dermaroller. In fact some of them even use needles that are 3 mm long. "The only problem is when silly people buy online larger versions even 1mm, 1.5 or I've even heard of a lady using a 2mm every day . She ripped her face to shreds tore all her collagen and elastin fibres and scarred heavily and bled and got infected. This level is only used by a derm in a proper clean environment or in surgery for extreme acne or scarring or stretch marks . The only safe way for us at home is the teeny needle and it will far surpass our needs." - 0.2 or 0.25 mm long needles can be used every second day on the same skin area. - 0.5 mm long needles can be used once or twice a week on the same skin area. - 1 mm can be used every two weeks on the same skin area. - 1.5 mm can only be used once every three to four weeks on the same skin area. - 2.0 mm can only be used once every five weeks on the same skin area, and only if you have the knowledge to judge which part of the skin is thick enough to safely use this needle length. These are general, conservative guidelines. Males generally have thicker skin and can roll a bit more frequently. Some parts of the body such as the back and buttocks have thicker skin than other areas, and there you can shorten the interval somewhat. If you are a beginner in dermarolling and you plan to use it on your face, please buy a dermaroller with shorter needles such as 1.5 mm. A 2 mm needle length is not recommended for beginners but for those already proficient with dermarolling. Concerning dermarolling at home with dermarollers longer than 0.5 mm: It is safe, provided you disinfect the skin before you roll and clean and disinfect the dermaroller after you roll. Not a single customer wrote us he/she got an infection, neither will you read about such cases often online, while in fact tens of thousands of people in the world are home rolling. We alone sell over a thousand rollers a month. Obviously, one should not do stupid things like storing ones dermaroller in an open box next to a toilet, etc. There are many websites selling dermarollers that do not even explain their customers that they have to disinfect. We publish a dozen pages of instructions that include how and with what to disinfect. 1 mm or longer needles are really necessary when you have a problem that affects both the epidermis and dermis. A 0.5 mm dermaroller penetrates about 0.3 mm into the skin and reaches the top of the dermis (depending where you roll because skin thickness is not the same all over the body) and may improve shallow acne scars but mostly you need longer needles. Stretch marks are in the epidermis and the dermis. They usually reach reticular dermis which is the deepest part of the dermis. No, it doesn't matter if you roll skin that is unaffected by stretch marks. Dermarolling itself improves stretch marks and Tretinoin will hopefully cause an additional improvement. Dermarolling will also very much enhance the penetration of Tretinoin into the stretch marks and enables tretinoin to get deep into the dermis where it is needed. I do not recommend applying Tretinoin right after dermarolling because it is acidic and it will sting but in case of stubborn scars or stretch marks (even for old white ones) I do recommend it and you will have to bear some stinging. Note how I do not specifically discourage its use on open skin, because contrary to what is rumored online, there is no way you can "poison yourself with vit. A" like that. Unfortunately no, but instead of dropshipping A-Ret, we will start selling our own Tretinoin around Christmas or January and there will be no restrictions because we will offer the option of an unlabeled jar that should pass customs inspection..
Corticoids are well known for causing wide and deep stretch marks. You would have probably developed stretch marks anyway as a result of your pregnancy (about 90 percent of women develop stretch marks during pregnancy) but corticoids likely aggravated the depth and width of your stretch marks. Corticoids weaken the connective tissue in the skin and make the skin vulnerable when stretched. After three months (each stretch mark has then been rolled three times), give your skin a one-month break and then again roll for three months, again one month break etc. When you roll an individual stretch mark with the narrow dermaroller, you will try to concentrate on, and target the stretch mark but the dermaroller will also "hit" the skin surrounding the mark, which is normal and OK. Wait at least one day. If you roll on Saturday, you can apply makeup on Monday morning provided the skin is not "raw" - meaning that it is not very red, swollen etc. In most cases, the redness after dermarolling with a 1.5 mm roller subsides within several hours. Keep the rolled skin moisturized. Dermarolling or needling a hypertrophic scar is a good idea but you must be extra careful when it is a keloid. It is not the same thing. The difference between a keloid and a hypertrophic scar is that a hypertrophic scar is raised but it is more or less within the boundaries of the original injury. Keoloid scars totally outgrow the original boundaries of the injury and they grow to all directions. A person prone to keloids (it is rare) can get a huge scar just after a bug bite or vaccination. You can needle/stamp a keloid but initially, treat just a very small part of the keloid to see how it responds. Keloids are unpredictable. - After needling, perform pressure massage. Apply pressure with your fingers onto the scar spot by spot. Apply pressure to each spot quite strongly for about 20 seconds. Repeat the pressure massage daily (but only three times a week in combination with needling). On thick/tough hypertrophic scars, apply wart remover once a week (for sale OTC, usually contains salicylic acid and lactic acid). Apply without needling. -Every three weeks, needle or stamp the scar densely and deeply to crush the scar collagen. It works for both red and white stretch marks. The best is to massage it into individual stretch marks after single needling but if you have no time for single needling, apply it after dermarolling. -Do the same routine as in week 1 until the rolling day. Roll the stretch marks on the day it suits you the best. Roll them densely. -Right after dermarolling, massage some Tretinoin (A-Ret) into the individual stretch marks. (You can apply Tretinoin onto the whole rolled area but this will be painful because Tretinoin is acidic and it will sting). First do a small test patch to see how your skin reacts to it. -Wait about ten minutes and apply a bit of Infadolan to protect the rolled area. Continue applying Infadolan for at least five more days. Keep the dermarolled area moisturized, apply vit. C and Tretinoin at least twice a week. Do not apply both the same day. Dermaroll again at the end of those three weeks. This time, instead of applying the Tretinoin immediately after dermarolling, use the copper peptides. Cut a small piece of the mask and smear it on your marks, put the rest of the mask back into the sachet, close it with a paperclip and store it in the fridge). When the liquid from the mask sinks into the skin, apply a bit of Infadolan and continue using it for at least five days. Apply copper peptides (until you run out), Tretinoin and vit. C for the next three weeks, each twice a week. Do not use them on the same day. If your skin gets too irritated, reduce the frequency of application. Keep the area moisturized. At the end of these three weeks, dermaroll again and use Tretinoin immediately afterwards. The above is just a general suggestion and can be adapted to the situation. Do you mean you are not our customer? I wasn't aware that Infadolan was sold anywhere else, would you mind saying where you purchased from? Actinic (solar) keratosis is caused by repeated sun damage. You should definitely increase your sun protection. Only a small percentage of acnitic keratosis cases becomes malignant but I suggest you go to see a doctor. They can do a diagnosis and possibly treat it with liquid nitrogen or a prescription of fluouracil. You can try applying an anti-inflamattory cream such as a cream containing salicylic acid or diclofenac or ibuprofen, or apply diluted Tee Tree Oil. Or buy NUROFEN rapid capsules or NAPROXEN capsules and pierce them. They both contain a nonsteroidal anti-inflammatory subtance. It is all for sale OTC in pharmacies. You have to use it long-term. I do not think using a dermaroller on solar keratosis is a good idea. You can roll your face but do not roll over the actinic keratosis area. Vit. E is not an etheric oil and you do not have to dilute it at all. Thank you Daisy and Loose skin for you postings. It's funny, two weeks ago I wrote the first part of my "How to lose weight" article and my main points are identical with your dieting tips. Permanently quitting sugary drinks is an essential step in losing weight and, if you don't substitute it with another sources of calories, a very effective way for permanent weight loss. No, I do not think it is a good idea to roll over skin with large bulgy veins. Especially not with a 2 mm dermaroller. If you cannot avoid rolling over them, do not apply any pressure on the roller. Yes you can definitely use a dermaroller, dermastamp or single needling on hypertrophic scars. Not on keloid scars though. The difference between a keloid and hypertrophic scar is that a hypertrophic scar is raised but it is more or less within the boundaries of the original injury. Keoloid scars totally outgrow the original boundaries of the injury and they grow in all directions. A keloids-prone person can get a huge scar just from a bug bite or vaccination.